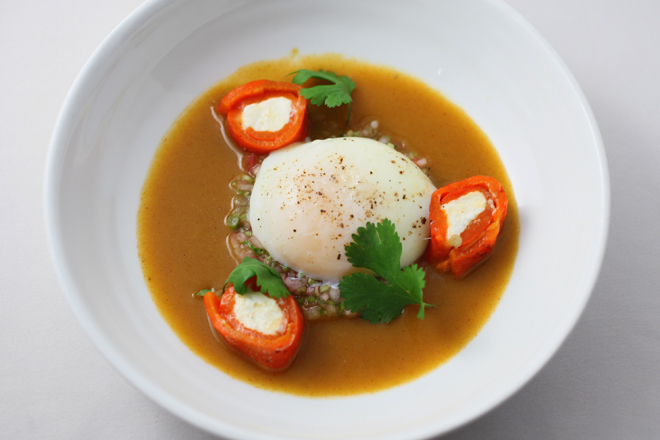 FRESH Rabo de Zorra: Roasted Nichol’s Farm poblano chile filled with Prairie Fruits goat cheese, perfectly poached egg, xoconostle, serrano chile. 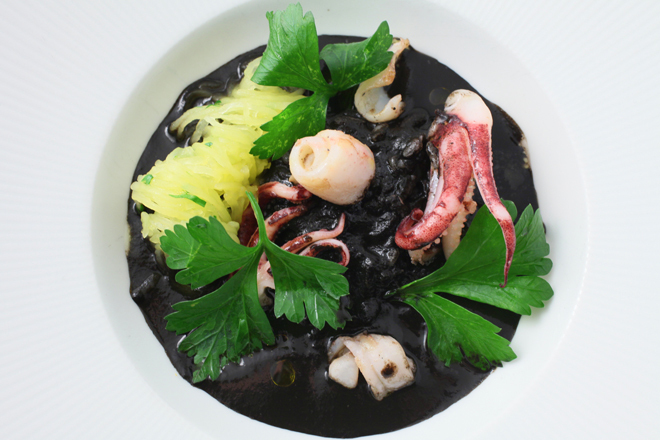 ANCIENT Calamares en su Tinta: Seared calamari in its dark, silky ink sauce, limey spaghetti squash, parsley, Baja Precious olive oil. SOULFUL Sopa Seca de Fideos: Toasty vermicelli noodles, smoky tomato-morita sauce, crispy chorizo, local brussel sprouts two ways, house made crema. 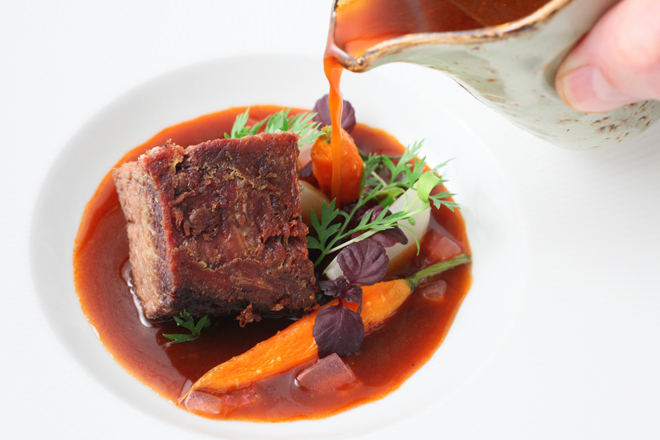 BOLD Mole de Olla: Smoked Creekstone Beef shortribs, beefy, two chile broth (guajilo, ancho), salt cured turnips, tangy, compressed xoconostle, roasted local baby carrots. 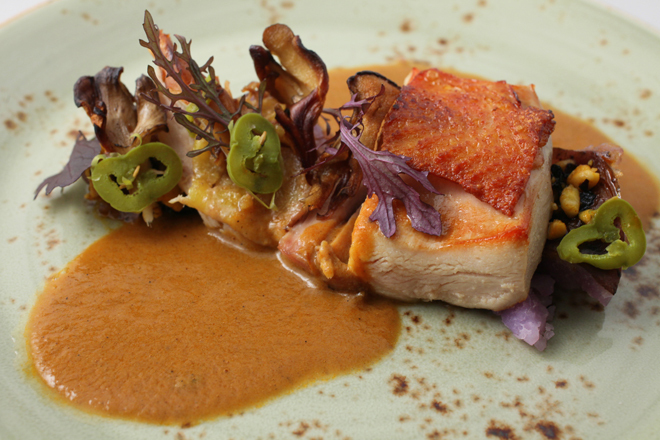 COMPLEX Pheasant Two Ways: Seared Breast, “confit” dark meat, tomato-almond sauce, roasted local potatoes coated in salsa macha, maitake mushrooms, pickled jalapeño, Bayless garden greens. 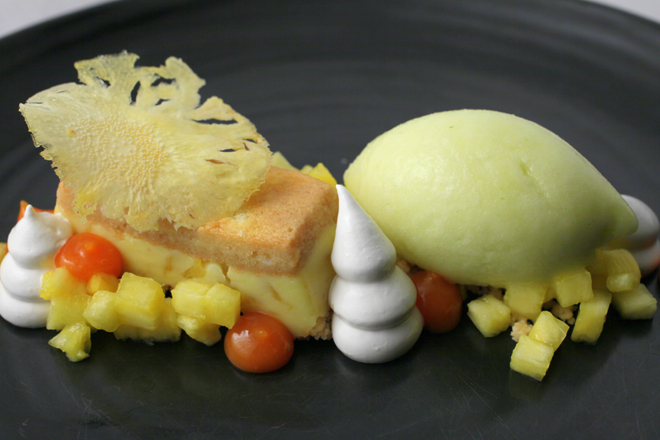 ENCHANTING Postre de Piña: Brandy-drenched ladyfingers layered with pineapple, luxurious pastry cream & toasted almond crumble, pineapple-mint sorbet, silky mango. 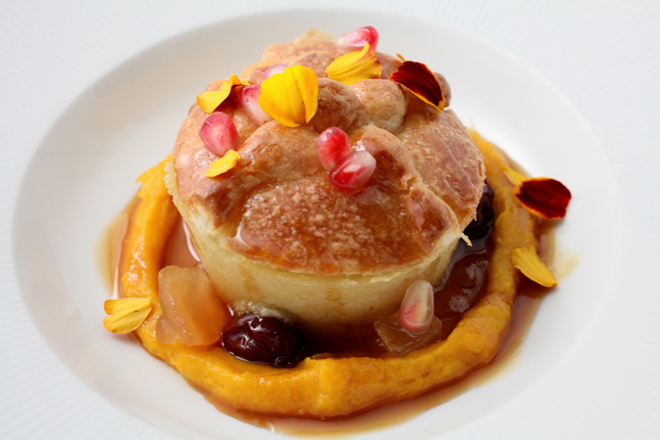 LUXURIOUS Pan de Muerto: Warm brioche bread pudding with raw sugar syrup, calabaza en tacha crema, brandied Seedling Farm cherries, pear-ginger compote. 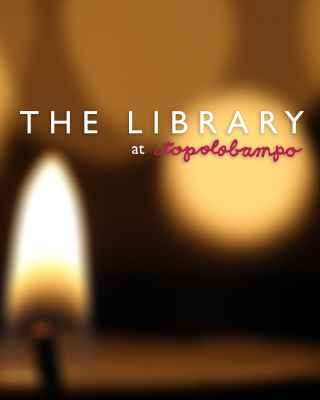 The newest Perfect 7 menu at Topolobampo is the latest to reach into the past for inspiration. But this time, it’s a shorter trip. Instead of reaching to, say, Mexico City circa 1671, we head to Mexico City, 1941. 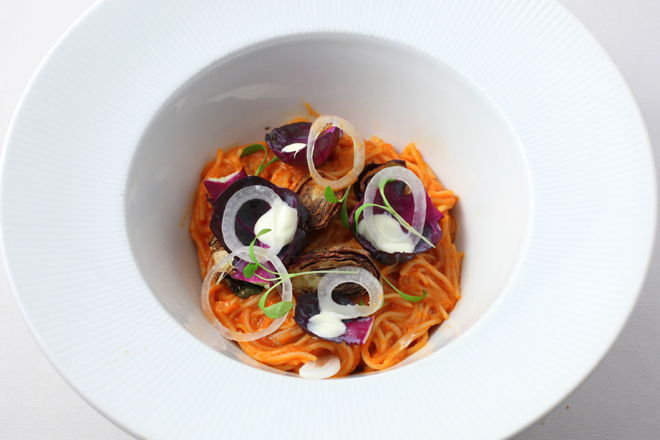 Here you’ll find a lot of dishes that are now classics— fideos, mole de olla, pan de muerto—prepared with a nod to history but with Topolo’s contemporary flair.